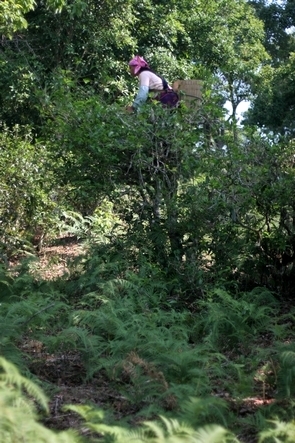 Harvesting Pu Er, a highly perilous work ! In China, in Yunnan province where they produce Pu Er, tea plants are sometimes left to grow into proper trees. It is thought that the leaves of these “wild” tea plants are better. But this makes harvesting perilous: the pluckers have to climb a ladder into the tree and harvest buds and tea leaves, while remaining balanced on the top. Impressive.